As part of our on-going mission to make trends in development projects easily accessible to the community, this article presents some of the preliminary results of our analysis of market development projects in Africa. Project data was gathered using Project Completion Reports (PCRs) from various NGOs, donor websites and databases. The extracted data was wrangled, cleaned and analysed through the Senca Research Explore system. With a nominal GDP of $100bn, Morocco is the 5th largest economy in Africa. Despite its economic standing, the country suffers from high unemployment, poverty, and illiteracy, particularly in rural areas. Key economic challenges for Morocco include reforming the education system and the judiciary. Moroccan development activities have been focused on the development for all without the exclusion of vulnerable groups and women, including the agriculture and marine fisheries sector as the engine of economic and social development; sustainable management of natural resources and improved living standards for rural people, with an emphasis on vulnerable populations, in the context of adaptation to climate change; and the management of food crises. Projects in Morocco, both completed and underway, were analysed using the Senca Explore project analysis and experience analysis software. The projects in the dataset focused on economic development, entrepreneurship, youth and women employment and infrastructure development. 83.33% projects were funded by the International Bank for Reconstruction and Development (IBRD), 11.11% of projects were funded by the MENA Trust Fund (Middle East Northern Africa trust fund), and only 5.56 % of projects were funded by the African Development Bank (ADB). Whilst down from 2013 project funding in Morocco remained robust in 2017 as evidenced by the chart below. The types of projects that were funded included urban and rural development, social protection and economic development, economic and agricultural development, financial governance and economic recovery. Projects in Morocco have been concentrated on solar power, sanitation, roads, social inclusion and employment. 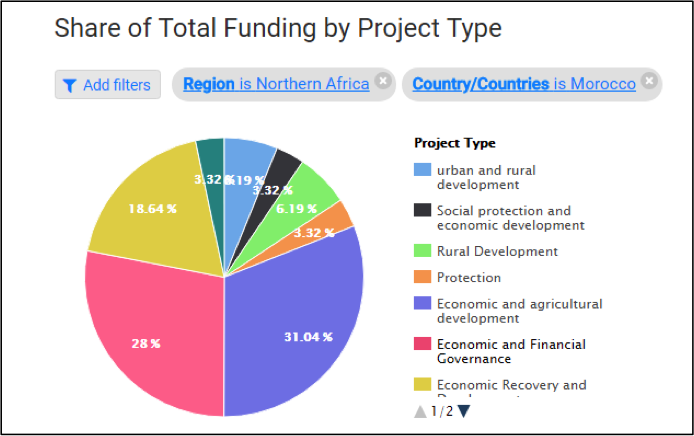 The figure below shows the share of funding each project type received with 31.04% ($1 003 200 000.00) of funding for economic and agricultural development and 28% ($904 900 000.00) funding for economic and financial governance. ‘Experiences’ are the term the Senca Explore system uses for lessons learned. The system categorises lessons learned that have been documented in project completion reports. 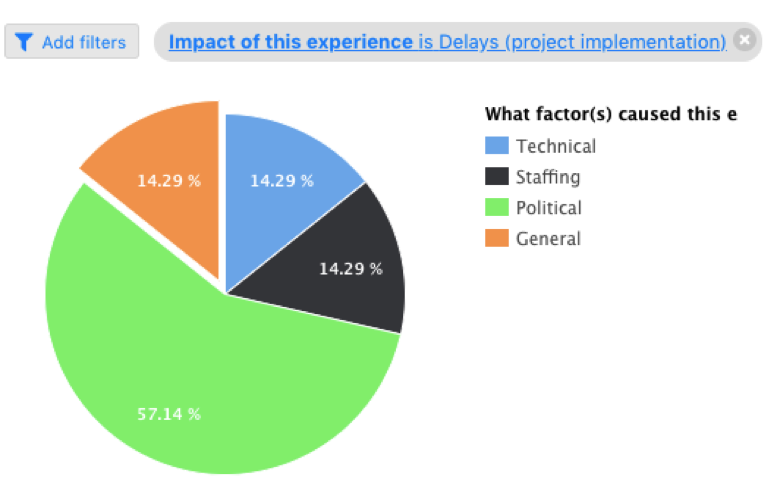 Only 23.08% of project completion reports reported negative experiences and 76.92% had only positive experiences. Signalling a positive outlook on the implementation and progress made on projects. Of the few negative experiences that were found, delays in project implementation was the common thread. The reasons for these delays are outlined below. Overall, funding of projects in Morocco remains robust and continues to target the country’s most critical developmental needs through market developing initiatives. Although unemployment is still an issue in Morocco, continued funding of projects and infrastructure will provide jobs and create employment amongst women, the youth and in rural regions.